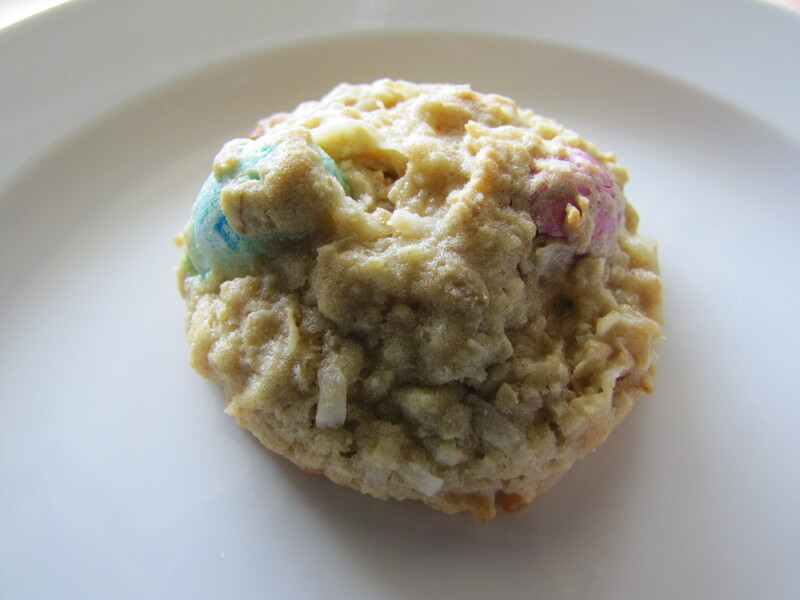 With Easter just around the corner I decided to whip up some cookies using the fun pastel colored coconut M&M’s. 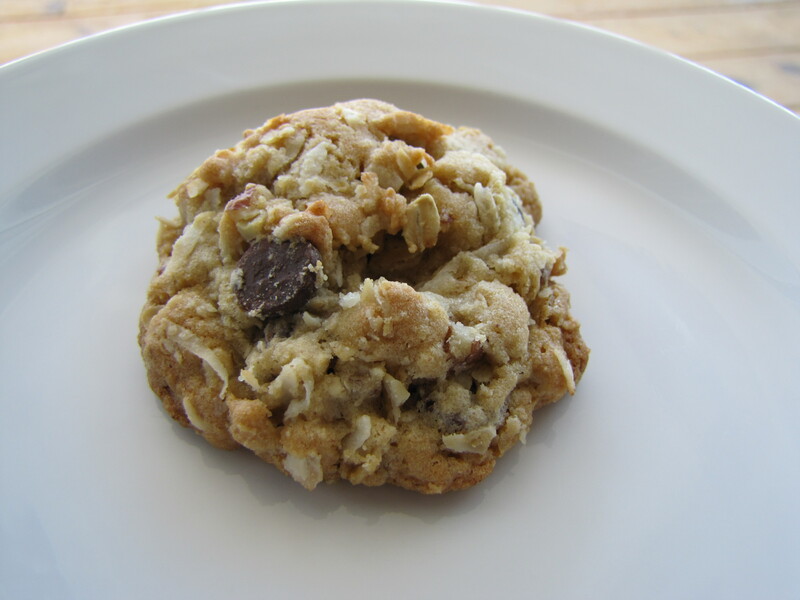 This recipe is based loosely on the Quaker Vanishing Oatmeal cookie recipe that I love so much. I basically adapted the recipe based on what ingredients I had on hand. I typically toast my coconut before using it is baked goods but skipped that step this time around. I found that the untoasted coconut (while not as ‘nutty’ flavored as the toasted coconut) caused the cookies to remain nice and chewy, so long as you don’t over-bake them. I enjoyed the coconut M&Ms in the cookie but to be honest would break them up next time. I found the size of them (about the size of a peanut M&M if not larger) was a bit too large for these cookies. They were fine right out of the oven when the chocolate was all melty and gooey on the inside, but once they cooled, the chocolate pieces were large and awkward to eat in the cookie. The chopped M&Ms may not look as pretty but I think the size would better compliment the cookie. In large bowl, mix the butter and sugars until creamy. Add egg and egg yolk and vanilla; beat well. Slowly add flour, baking soda, and salt; mix well. Add oats and coconut; mix well. Drop dough by rounded tablespoonsful onto ungreased cookie sheets. Bake 8 to 12 minutes or until light golden brown. With Spring weather finally here, I haven’t been in the kitchen long enough to bake anything worth blogging about lately. I have received several emails asking for recommendations for desserts so I thought I would take a minute to link back to a few of my favorite recipes over the years. One would think that the top rated recipes on my site would be the only ones I recommend, however, there are so many recipes that I remake time and time again that my Taste Tester or friends and family love. *I love this dessert in the summer! I don’t bake cakes too often as you can probably tell by looking through my blog. I like cake but always feels it takes forever to make. I can rarely just make a cake without frosting too, and if I make frosting, then I need to make it look half-way pretty but decorating it. Overall I think cakes take too many ingredients, have too many steps and in the end aren’t worth my effort. I have had chocolate cake on my mind lately. Not sure why but I can’t stop thinking about it. I gave in and finally paged through my cookbooks only to find this super simple, super quick cake recipe that did not call for ingredients (you know, like cake flour or buttermilk) that I usually don’t buy. Just plain and simple. 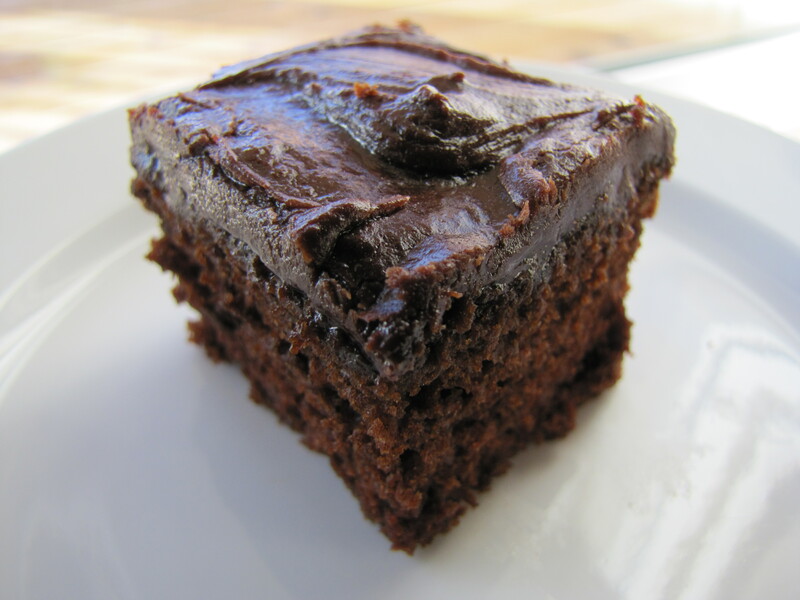 Plus it came with a very quick ganache recipe to pour on top instead of frosting. SOLD! What I had after 45 minutes (30 of it baking) was a moist but dense chocoate cake with thick, sweet liquid chocolate fudge (best way I can describe it) on top. Oh my, I was in heaven! Now this is not the best ever chocolate cake in the world but it did more than satisfy my craving and the amount of hands on time it took was so minimal I was in awe at how great it turned out. I did pour the glaze over the cake while it was still warm and I would do so again in the future. I ate this cake every night for a week, simply nuked for 20 seconds to get the frosting a bit melted and dug in! So yummy! In large bowl mix flour, sugar, cocoa, baking soda, baking powder and salt. Add milk, oil and vanilla. Beat for 2 minutes. Add eggs and beat 2 minutes more. Pour into pan and bake for 30 minutes or until toothpick inserted in center comes out clean. Melt chocolate and butter in microwave (in 20 second intervals) until melted. Beat in powdered sugar and water. Add more powdered sugar or water until pouring consistency. If you are looking for a recipe that takes VERY few ingredients, can be made from start to finish in 30 minutes and is super delicious, look no further. I have had this recipe for years, it was in a homemade cookbook that I got from a school teacher with recipes compiled from her students. There is no name or citation to this recipe so I apologize if this is your recipe (just email and let me know and I will give credit). 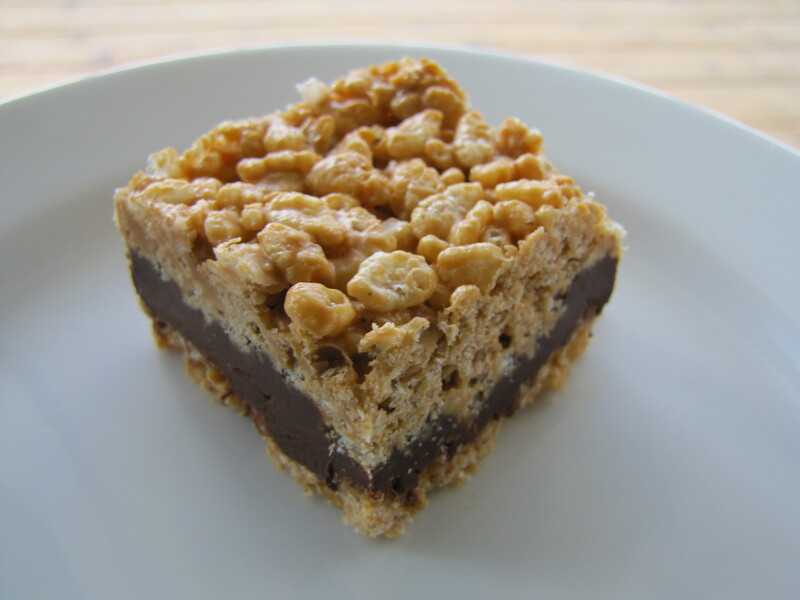 The base of the bars is a sweet, buttery oatmeal crust topped with a chocolate and peanut butter mixture. The finished product is like a sinful granola bar. I don’t think they taste a lot like a Butterfinger (since they are named that) but I love them none the less. These bars are not for the calorie conscious but we all need a treat now and again right? 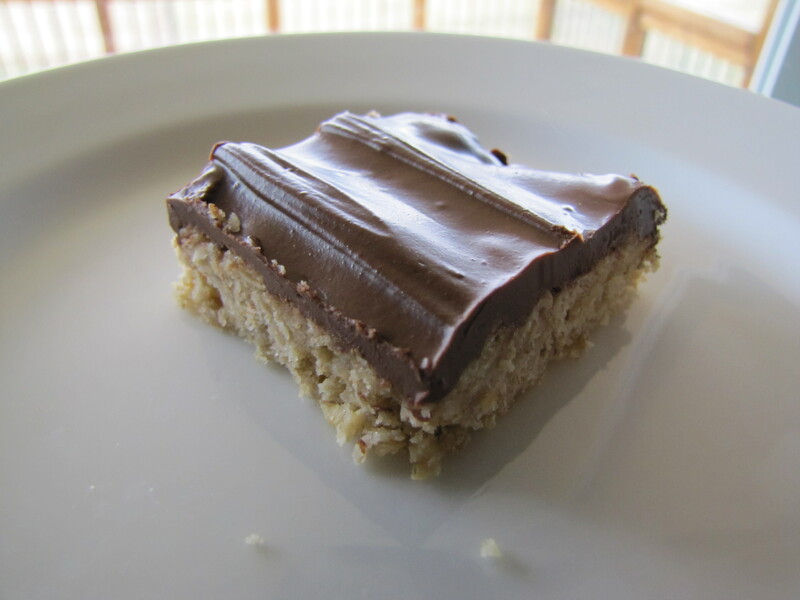 The only down side to these bars is they are very crumbly when warm and still slightly crumbly when cooled. I have made these millions of times and can not get them to be less fragile (email if you find the cure). I keep making these because they take care of my sweet tooth with a small bar, so I don’t feel guilty about eating one (or 10). I have added toffee pieces to the top of the chocolate mixture (while warm) for a bit of a twist. In a medium bowl mix together the first 4 ingredients until combined and press into the bottom of the pan. Poor melted mixture over slightly cooled bars. *I have also halved this recipe and used an 8×8 pan and baked for about 15 minutes. I found this recipe in my google reader, I had added it months and months ago but never got around to making them. Having a few extra days off for Christmas and having not consumed enough sugar (yeah right), I decided now was a good time to try them out. I am not sure if I did something wrong or what, but these really didn’t do it for me. I wanted to like these, I really really did! But, instead, I found these to be really dry and to have too much butterscotch flavor for my liking. I followed the recipe exactly so I am not sure if I was just unlucky in the kitchen that day or what. Looking at the comments it seems many others like these so it may just be my finicky tastes as well. The end product kind of reminded me of what my family calls Special K Bars except not nearly as good and a bit more work to make. I am willing to give these another go and maybe add more peanut butter next time to balance out the butterscotch flavor but I think next time I am craving a cereal snack bar I will stick with ones I know will satisfy my cravings! In a large saucepan over medium-low heat, melt the butterscotch chips and peanut butter, stirring. When smooth, remove from heat and add the crisp rice cereal. Stir to coat. Place half of the cereal mixture into the pan and pat down evenly. Place in the refrigerator to let it firm up a bit while preparing the chocolate. Place the chocolate chips and butter in a microwave safe bowl. Melt together in the microwave over medium-low heat, stirring every 60-90 seconds, until smooth. Mix in the powdered sugar and water. Spread the chocolate evenly over the cereal layer in the pan, then gently pat the remaining cereal mixture evenly on top. Refrigerate for at least two hours, then cut into squares with a sharp knife. I have had this recipe for what seems like years (probably because it has been years, my time flies). I first made this recipe after a pretty bad break-up and these soon became my go-to-when-ever-you-need-a-big-hug cookies. The recipe is very simple to follow though the ingredient list is a bit longer than cookies I typically make. I don’t know where they got their name as the recipe was given to me from a friend. I have noticed other similar recipes and it seems the recipe below is based off of Laura Bush’s cookie recipe (though I had this recipe long before Laura Bush’s was made public, go figure). 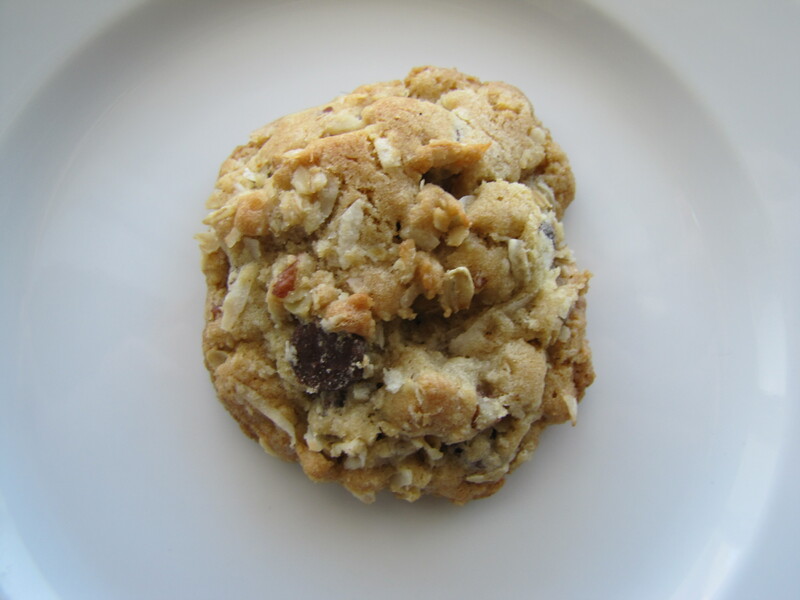 What you end up with is a sturdy but not dry, oatmeal cookie with tons of flavor. 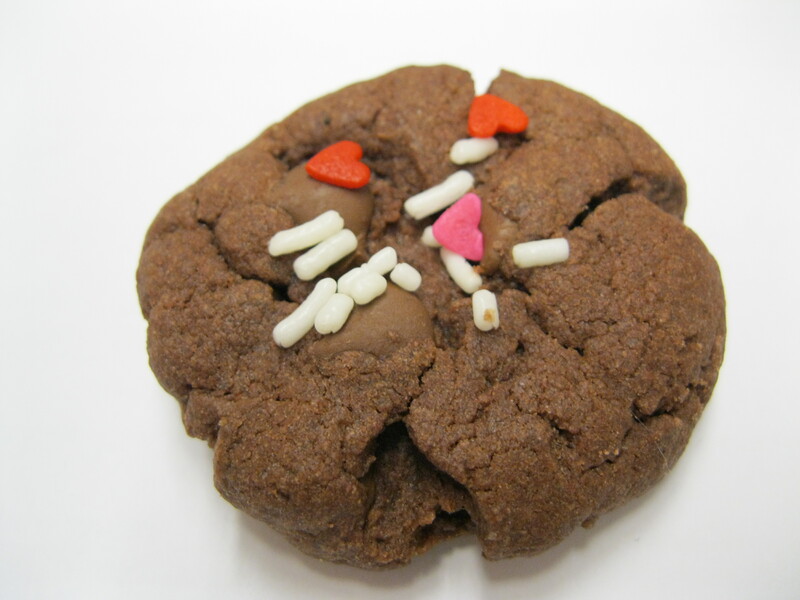 I have described these cookies as a little party in your mouth with all of the flavor and texture going on. With each bite you get a subtle hint of cinnamon, the crunchy pecans, a bit of coconut and smooth creamy chocolate. Really, what more could a girl ask for to put a smile on her face? I know some of you don’t like cinnamon (I am not a lover, especially with chocolate) but the flavor here is mild and just provides that little ‘extra’ flavor profile without taking over the cookie. I like making the dough one day and baking the next, I find the chill time really enhances the flavor of the finished cookie, but I have also baked these right away and did not have any go to waste (if you know what I mean??). There is really nothing I would change about this recipe, I will caution not to overbake or the cookies will become crunchier than what they should and the coconut can burn a bit (espeically if it is sticking out of the dough ball). Preheat oven to 350 F. Line baking sheets with parchment paper. Mix flour, baking soda, baking powder, cinnamon and salt in bowl. In a large bowl of your stand mixer, beat butter on medium speed until smooth and creamy, 1 minute. Gradually beat in sugars; beat to combine, 2 minutes. Add eggs, one at a time, beating after each. Beat in vanilla. Gently stir in flour mixture a little at a time until just combined. Stir in by hand the chocolate chips, oats, coconut and pecans. Bake in 350 F oven 17 to 29 minutes, until edges are lightly browned; rotate sheets halfway through. Remove cookies from rack to cool. NOTE: I make regular size cookies and bake for 8-12 minutes or until golden on the bottem and the sides are set. I allow to cool on the baking sheet 5 minutes and then transfer to a papertowel lined cooling rack.